Festival of Light and Bliss! When Maharishi inaugurated the Assembly in July, 2006, these were the descriptive words he used. Since then, many thousands of course participants from North America and around the world have affirmed those words in their own experiences. Please come and join us, whether for a weekend or longer—or stay permanently. Applications are taken online. We welcome questions (see “Contact Us”) especially if answers are not found on the other links. Men arriving for morning program at the Maharishi Patanjali Golden Dome of Pure Knowledge on the campus of Maharishi University of Management. 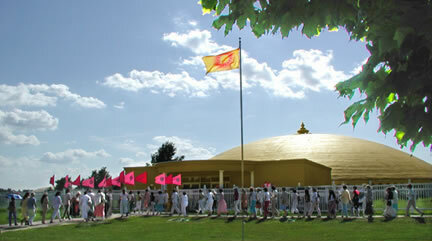 Inside they participate in the largest Super Radiance program outside of India as course numbers grow toward 1700. 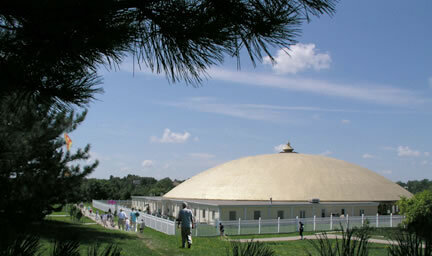 On campus, ladies from across North America and the world gather for program in the Bagambhrini Golden Dome of Pure Knowledge. 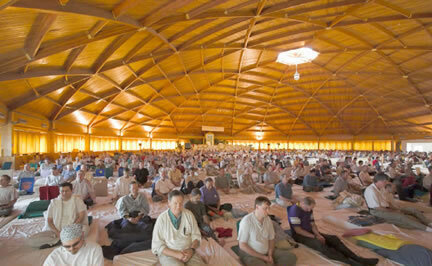 Participants may also use the Maharishi Vedic City Peace Palace. You are welcome to apply for the IA Assembly whenever you can come, even for a short time. Please see “Application, Financial Support, and Vedic Performance Forms”.